Installation options is simple, no need to install any additional software, direct use of cable can be connected to the computer equipment.Under normal operation of the computer, you do not need to turn off the computer and KVM switches can connect or disconnect the connected computer.No external power supply, the host server automatically assigned, plug and play; Design-portable, it can be placed on the table.Support DOS, Win3.X, Win95 / 98 / 98SE / 2000 / ME / XP / win7 / Win8, WinNT, Netware, Unix, Linux syatem.Suitable for the securities market, the office, remote education, multimedia education, exercises, multimedia central control computer demonstration and other industries.100% New and high quality.Product Name: VGA SwitchMaterial: ABS plasticColor: . 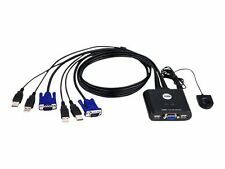 Supplied with 4 KVM cables for connecting to each PC. 4 x KVM Cables. It is great for workstations, test benches, networks or anywhere were tasking between computers is required. Easy to install and operate, simply switch between computers by the Push-Button on top of the device. Compliant with VESA DisplayPort Standard version 1.1a. Share a USB device with an extra USB 2.0 port. Provides an extra USB 2.0 port to share a USB device. Patronen für Brother. Patronen für Canon. Patronen für Dell. Patronen für HP. Patronen für Kodak. Patronen für Lexmark. Patronen für Samsung. durch diesen KVM Schalter können Sie zwei Computer mit nur einem Satz 2.0 USB-Maus und -Tastatur verbinden. This sale is for 1 piece. 1U Rackmount KVM. Rackmount ready Keyboard, 15" display with built in mouse! This particular item falls into the categories new open box. Item was taken out of the box to inspect the product and to take pictures. See pictures 2 thru 6 for the actual item you will be getting. If you do not see it pictured, do not expect it. This is a final sale item. 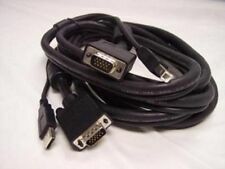 -QTY5 x MCuTP20-USB Raritan KVM Cables included. 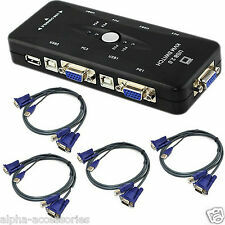 -8 KVM RJ-45 Ports; 3 USB 2.0 Ports; 1 VGA Port; 1 RJ-11 Modem Port. -KVM Max Supported Video: 1920x1080. Digital KVM Extender for DVI-D, Audio and USB signals over Gigabit network. Sends DVI-D and Audio signals over Gigabit Ethernet. Features 2 USB Ports for connecting Keyboard, Mouse, Mass Storage and Printers. Part Number: 3R870. Model Number: Y5367. Local pickup is available for free. 8-Port HDMI USB KVM Switch. Outputs: (2) USB Type A Female (Keyboard and Mouse), (1) HDMI Female (Video). Supports resolution up to 1920 x 1440 (1080p). Inputs: (8) HDMI Female, (8) USB Type B Female. Resolution: up to 1920x1440. Bandwidth: 200MHz. 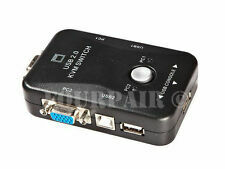 2-Port KVM Switch(KVM Cables Are NOT Included) . 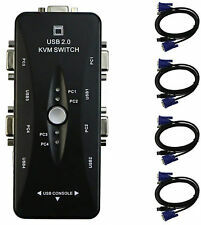 2-Port USB KVM Switch. Compatible with XGA, SVGA, VGA, and UXGA. Manual Push Button Switching. Easy installation, just plug and play. What Makes Us Different?. Helpful Links. The DominionKX2-464 is a KVM over IP switch with 64 KVM ports, 4 remote user ports and 1local user port for connection at a server rack. These IP switches also featureRaritan's Virtual KVM Desktop. This feature allows users to scale a targetserver's display to any size, from thumbnails to full screen video. 1x 95P7592. Robert Schoenlank. 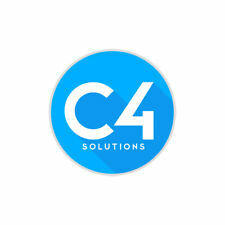 Technical Sales Executives. Server & Netzwerktechnik. Technische Daten Gerätetyp. 16 x KVM port(s). 16 x LAN - RJ-45. 1 lokaler Benutzer, 2 IP-Benutzer. An Rack montierbar 1U. Es gelten die gesetzlichen Bestimmungen von 12 Monaten Gewährleistung für Verbraucher. This is a tested working, used, clean, HP EMC 8-Port 0x2x8 KVM Server Console Switch. HP SKU #:AF616A. HP Spare #:517690-001. HP Part #:513735-001. Form Factor Desktop. Technical Information. Green Compliance Certificate/Authority WEEE. Le connessioni hot-plug ti consentono di aggiungere o rimuovere dispositivi dallo switch KVM senza doverli spegnere. P.iva: 05294791008. Via Casale Romani, 1 Lariano (Roma). newcam srl. VENDITORE PROFESSIONALE . Raritan DKX2-101-V2 - KVM Over Ip. Condition is Used. Comes as pictured with power supply and original box. Device Type: KVM console - 17". Height (Rack Units): 1U. Color Support: 16.7 million colors. Interfaces: 8x keyboard / mouse / video - 50 PIN Centronics, 1x VGA - 15 pin HD D-Sub (HD-15), 1x keyboard - 6. The CE790 is a IP based KVM Extender with automatic cable detection (Auto-MDIX) and RS-232 serial functionality that allows access to a computer system from a remote USB console (USB keyboard, monitor, and USB mouse) anywhere on the intranet. 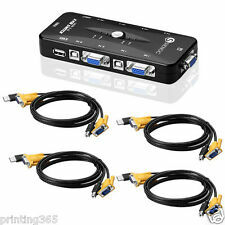 4-Port HDMI USB KVM Switch. Outputs: (2) USB Type A Female (Keyboard and Mouse), (1) HDMI Female (Video). Supports resolution up to 1920 x 1440 (1080p). Inputs: (4) HDMI Female, (4) USB Type B Female. No other cables are included. 1 Key Included. New-Open-Box, EMC Model 091-000-081. Used Products have been previously used and are in working condition. o On New Product, Manufacturers Factory warranty, if any, applies. For sale is a Belkin Omniview keyboard, video, mouse (KVM) extender set. We have two sets available. We will make the situation right, or help you to the best of our ability. Step 4 - We do a final diagnostic test on the computer to verify that it is ready to be sold. We love what we do and we do it with integrity. This sale is for a StarTech 4 Port SuperSpeed USB 3.0 DisplayPort KVM Switch SV431DPU3A. We will also never change. We try to describe our item’s to the best of our knowledge, and technical experience. Lindy 38411. Video port type: DisplayPort. Product colour: Silver, Bandwidth: 10.8 Gbit/s. Lindy video switch DisplayPort. 2 Port 4K DisplayPort Switch. - Switch between two DisplayPort 1.2 compatible signals with a simple button push. Aten CS22U 2-Port USB Cable KVM Switch. Dispatched with Royal Mail 2nd Class. KVM Switch is NEW. KVM switch. 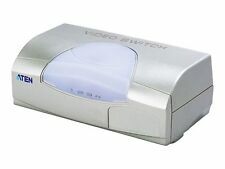 Video input type: PC:4x USB,4x VGA. IBM 41Y9318 41Y9315 - IP 16 Port KVM Console 1U Rackmount Switch Refurbished Unit ---DEVICE TYPE : KVM SWITCH - 16 PORTS ---ENCLOSURE TYPE : RACK-MOUNTABLE - 1U ---PORTS : 16 X KVM PORT(S) ---KVM LOCAL USERS QTY : 2 LOCAL USERS ---SERVER CONNECTION VIA TWISTED PAIR : CAT5 ---KEYBOARD / MOUSE INTERFACE : PS/2 ---MAX RESOLUTION : 1600 X 1280 ---FEATURES : SERVER CONNECTION VIA TWISTED PAIR EXPANSION / CONNECTIVITY : ---INTERFACES : KEYBOARD / VIDEO / MOUSE (KVM) : 16 X RJ-45 1 X RS-232 - ---MANAGEMENT KEYBOARD : 2 X GENERIC - 6 PIN MINI-DIN (PS/2 STYLE) MOUSE : 2 X GENERIC - 6 PIN MINI-DIN (PS/2 STYLE) DISPLAY / VIDEO : 2 X VGA - 15 PIN HD D-SUB (HD-15) USB : 4 X 4 PIN USB TYPE A POWER : ---POWER DEVICE : POWER SUPPLY - INTERNAL ---VOLTAGE REQUIRED : AC 120/230 V ( 50 - 60 HZ ) ---POWER CONSUMPTION OPERATIONAL : 12. One input to Six output transmitter for UXGA, YUV, Y/C and CVBS and Stereo Audio. The SCX–TX600 will split and extend a single video/data and audio signal to six outputs at a distance of up to 300m over CAT 5e-8 cabling. You are purchasing one ROSE RV1-CDKVT15 1U KVM CONSOLE 15" LCD KBD w/ Touchpad Dual Rail Rack Drawer with power cables. Mouse: Touchpad. Rack mounting brackets are included for mounting in a standard 19” wide rack. Raritan Dominion KX II 32-port KVM-over-IP switch in very good used condition, recently removed from a working installation. It powers and shows ready normally with no issues. Two power cords included but no connecting cables, rack mounts, manual or other accessories are present. DELL POWEREDGE 2161DS 16 PORT IP CONSOLE SWITCH - 520-275-007. For sale is this Dell 2161DS KVM Switch. And with compact designs, you can conserve valuable rack space in your data center. The KVM is fully functional and has been factory reset. Beginn und Ende derartiger Hindernisse werden wir dem Kunden unverzüglich mitteilen. Netzteil fehlt. ohne Netzteil. Wey Technology Connector Box. Wey Technology Connector Box. - Bei Käufern aus dem Ausland akzeptieren wir nur Vorauskasse. 2x1 DP USB KVM Switch allows you to share an HDTV or display USB keyboard mouse with audio and microphone among four USB and Dualhead DP computers. The 2x1 DP USB KVM Switch is DP v12 compliant CE FCC regulatory approved and RoHS compliant. Tested for full functionality. R2/Ready for Reuse. See photos for more detail. Here we have a Belkin Omniview CAT5 KVM Extender. LOCAL PICKUP: Local pickup is great! I can be flexible with scheduling - just ask! I know how fragile cast iron is. I willNOT mark them as 'gift'. Das Herzstück der AdderView CATx (AdderView AVX4024) ist eine erprobte und zuverlässige digitale KVM Audio-Switch mit 16 Ports. Adder AdderView CATx 4000 KVM Switch AVX4024 24 Port, OHNE Netzteil, KVM Kabel Adapter & weiteres Zubehör.